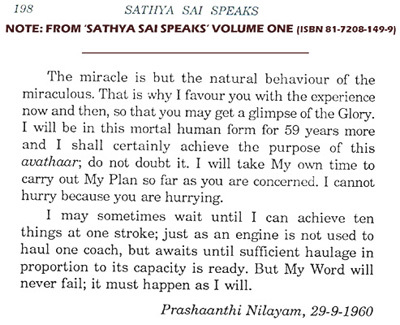 Certainly, Sathya Sai Baba was supreme in his ability to exaggerate. And, as even many better-informed remaining devotees know – only too painfully well – to lie, and to lie often. Anyone who is careful about statistics can only deplore Sathya Sai Baba grossly exaggerated Puttaparthi crowd numbers. And the also oft-repeated and gullibly believed estimates of his worldwide following. In not being upfront about this issue, the international Sathya Sai Organization fails badly. Yet, in the civic domain, it works hard to appear respectable. It gives public presentations. It lobbies local, state and national governments and the United Nations. It tries (frequently without success) to join in projects with mainstream civic and religious organizations. It falsifies – just like its founder falsified down many decades. Perhaps the Sathya Sai Organization should surprise us all and tell us how hugely – as our far-reaching exposure of this cult – its numbers fell away in its centers worldwide. Those who view statistics with integrity will wonder at the existence of an organization, which has any number of adherents who in their professions would never use, or be allowed to use, rubbery statistics, unjustifiable figures which it stands blind-eyed and allows to be cited in their publications and in media around the world. Notoriously, they do not submit to any authoritative means of deriving estimates. Unfortunately, and most carelessly and naïvely, some media, has cited Sai Baba’s own evaluation of devotee numbers. One of many examples of the so-called ‘Avatar of all Avatar’s’ mendacity – in this case his exceeding rubbery ‘statistics’ – Robert Priddy deals with humorously in a Youtube video clip (1 min 21 secs): Robert Priddy on Sathya Sai Baba at Stockholm book launch. Sai Baba himself has provided an unintentional but marvelous ‘punchline’ to Robert Priddy’s anecdote, which includes reference to Sathya Sai Baba’s expirically falsifiable crowd-numbers lie about 3 million people attending his 70th birthday in 1996. In what must have been one of Sai Baba’s greatest ‘miracles’, the Hillview stadium at Puttaparthi – what shall we say? – ‘expanded’ a great many times its real holding capacity of around 250, ooo. Even Pinocchio’s nose did not grow so many times beyond its default size …. This book launch in Stockholm, Sweden, which BBC television and radio’s Iris Asic and other media and public attended, was of Conny Larsson‘s book “Behind the Clown’s Mask”. Before widely exposing Sathya Sai Baba for serial sexual abuse of boys and young men, Conny Larsson was the co-leader (along with Bi-Ma Andén, a noted educationalist, who was also lucid and courgageous in exposing the abuses) of the Sathya Sai Organization in Sweden. Formerly a top Swedish film star, Conny Larsson has since worked as a rehabilitation therapist in the Swedish prison system. Rigmore Robert, a nationally prominent psychotherapist and cult expert, wrote the Preface to his book. See also: Robert Priddy’s bibliography and Conny Larsson’s ‘Behind the Mask of the Clown’, Reviewed by Robert C. Priddy, and review by: Åsa Samsioe – practising psychologist and ex devotee of Sathya Sai Baba. Ms Samsioe has wide professional experience dealing with sexual abuse among the young. She is one of former devotees from various parts of the world who have outstanding credentials in psychology, psychotherapy or psychiatry who have assisted those whom Sathya Sai Baba (and in some cases his teachers and others close to him) sexually and in other ways abused. A huge array of India’s power elites – including many successive Indian Prime Ministers and Presidents – who so often visited him – profoundly failed to go within light years of following his teachings about truth, right conduct, peace, love and non-violence. He himself failed to live up to them. Former devotees and others who have worked to expose the crimes, misdemeanors and spiritual betrayals of Sai Baba and many of his core leaders have faced enormous obstacles. One of these has been the failure of almost the entire Indian media. The honorable exception was India Today. In a professional way, it dealt with our witnesses (individuals of outstanding professional and other credentials) both from other countries and well as from India. To often, there there was the often skillfully disguised hatred of westerners only too familiar to experts on India – a trait interpretable as stemming from India’s long experience with British imperialism and, before that, the crashing waves of Mughal invasion. In dealing with her power brokers, no one should fall for the infinite charm. It is to the Indian media’s undying shame that foreign media in various countries had to take the lead in surfacing facts about the 1993 police killings in Sai Baba’s bedroom, the serial and wide scale sexual abuse of boys and young men, etc. Establishing the bona fides of former devotees from many countries around the world took coordinators a vast amount of time and hard work. However, with demonstrable intellectual dishonesty, individuals like the deputy chairman of the world Sathya Sai Organization, Dr G. Venkatarman, residing at Sai Baba’s Puttaparthi headquarters, tried to impute ill motives to many former devotees many of whom had outstanding records of service and devotion when members of the international Sathya Sai Organization, and attribute gross incompetence to the BBC, The London Times, The Telegraph, The Guardian, among others. Venkataraman’s poverty of intellectual discourse can be seen in various other directions, too. With telling use of documents, Robert Priddy, retired philosopher and social scientist of the university of Oslo, Norway, exposed Venkataraman for serious science plagiarism of a sort which, were the deeds not perpetrated in an India rank with corruption of every sort, would probably have seen him in great trouble in the academic world elsewhere. See: Indian Scientist Dr G. Venkataraman Accused of Plagiarism and: Sathya Sai Baba’s ‘Minister of Propaganda’ – Dr G. Venkataraman. This was not until the last stages Sathya Sai Baba’s illness, his death (about which leading devotees themselves questioned Sathya Central Trust’s highly irregular handling of matters), and the vast millions worth of currency, gold, silver and other valuable items which Sai Baba secreted in his private quarters. (How could) “a Trust – charged with due diligence! – first, dismiss all suggestions that a unaccounted treasure could lie hidden, and issue emphatic statements that all-is-above board – with only cheques from, and receipts issued to, donors – and, YET, later, only after repeated contradicting detection, come up with another explanation altogether? If they were let loose on the Sai Baba and Sai Trust saga, Indian newspaper cartoonists would have a field day, ….! You potentially have a great story. But will you and your Team dare to go for it, X? Where are all the editorials? The serious Ed.Op pieces? Where is there a persistent raising of vital questions – e.g., about the circumstances leading up to Sai Baba’s death/ the death certificate circumstances/ the ordering of his golden casket from a source in Bangalore well before his death / his body weight at the time of his hospital admission / the reported concern of Sai Baba’s team of highly senior doctors about lack of information on any medications being given to him before his emergency admission to their care / or about the lack of statements from doctors and nurses and, above all, Dr Safaya at the Sathya Sai hospital who resigned en masse / or about Satyajit (about whom there is so much silence, and yet so much noise – indeed bluster! – from V. Srinivasan and R.J. Ratnakar)?What of the on-again, off-again resignations of Ex-Chief Justice Bhagwati? And of the former world Sathya Sai Organization head, Indulal Shah? And so on ……..”. See: Sathya Sai Baba Saga: Is There Too Little Indian Media Critical Analysis?